An Oregon victory was almost guaranteed when the opponent is Portland State in these “money” games for the FCS school. The Ducks were supposed to play Texas A&M this week, but when the Aggies pulled out of the contract, the Ducks filled the schedule with their neighbors two hours north. The final score of 62-14 in front of 47,210 fans was important to be sure, but the Ducks (2-0) were looking to improve on the little things that need to be cleaned up before Stanford comes to Autzen in two weeks. 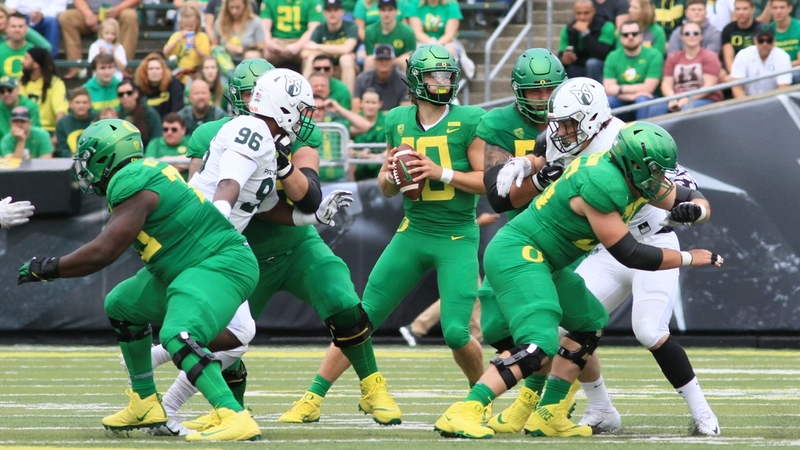 Quarterback Justin Herbert needed to be sharper with his throws and decision making, but even more that that, his receivers needed to help Herbert out by not dropping passes. Except for first drive that saw a couple of drops, the receivers caught nearly everything that was within reach. Herbert completed passes to nine different receivers. He ended the game 20-of-26 for a cool 250 yards, four touchdowns and zero interceptions. Of the nine receivers, Dillon Mitchell led with 55 yards, while Kano Mitchell might have won himself a starting spot with his solid first half performance, which included a touchdown. As for the running backs, Tony Brooks-James rebounded after a poor season opener with 21 carries for 107 yards and two second half touchdowns. CJ Verdell backed up his good initial contest last week with another solid game of 11 carries for 106 yards and a late touchdown. True freshman Travis Dye also made the case for more carries with his 58-yard effort, including a 49-yard touchdown run that showcased his sprinter’s-like speed. Oregon’s offense was efficient and methodical as the Ducks racked up 562 yards (296 rushing, 266 passing), an average of 7.4 yards per play. The Ducks were flagged just five times for 55 yards. Penalties killed Oregon a lot last season and so far this season, flags have not been a problem. It was flagged just twice in the opener. The defense also needed to work out a lot of bugs after the Bowling Green game such as missed tackles and missed assignments. Both were mostly corrected and defensive coordinator Jim Leavitt can feel better about his defense as they head into next week’s game against San Jose State. Portland State was held to just 224 yards of offense for the entire contest. The Vikings gained 71 yards on one play and 49 more on another. Take those two plays out and the Oregon defense holds its opponent to just a measly 104 yards. Strangely enough however, neither team committed a turnover. Kaulana Apelu and Austin Faoliu led the Ducks with seven tackles each. If there was one Portland State player that showed well for the FCS school it was tight end Charlie Taumoepeau. He was responsible for five of quarterback Jalani Eason’s seven receptions for 125 yards and both Viking touchdowns. Eason was harassed all day by Oregon’s front seven. He was sacked four times and hurried countless other times. The Ducks’ opening drive got off a shaky start as their receivers still suffered from the case of the drops. Three of Herbert’s passes found their mark, but were not hauled in. Despite that, the Ducks managed to meander down the field until Herbert found Redd streaking down the right side for an-18-yard touchdown and the early 7-0 lead. Drops offensively and missed tackles defensively plagued Oregon last week and while the dropped passes still showed themselves early on, the defense’s missed tackle woes seems to have been corrected. Portland State’s offense had absolutely nowhere to run. Herbert led the offense on a 99-yard drive that ended with a nine-yard swing pass to Hines for the touchdown and a 14-0 lead. Oregon’s focus on the second drive of the game was to let the tight ends and Verdell in on the action. Verdell ran for 41 of the 99 yards and Kano Dillon’s 20-yard reception on a third-and-nine extended the scoring drive. That wouldn’t be the last time the Vikings saw what Dillon could do as he scored later on. Duck fans didn’t have time to get up and buy popcorn before the Oregon offense was back on the field. Perhaps the turnaround was even too quick for the offense as it had it’s first three-and-out of the game. Oregon still led 14-0 and feeling good about itself. The defense stifled Portland State for the first 15 minutes of action with no indications of letting up. The Vikings mustered up just 19 total yards and two first downs. Dillon scored his first career touchdown in the second quarter and he dragged three Viking defenders about four yards into the end zone with him. That 20-yard touchdown pass made it 21-0 with 9:22 left until halftime. If Herbert thought his day might be close to over, Portland State made sure that wouldn’t be the case. The Vikings stunned the Oregon defense with a 71-yard touchdown pass. Eason found tight end Charlie Taumoepeau rambling behind a safety for the big scoring play. That might have been the wake up call the Duck offense needed as on the ensuing drive, it was nearly perfect. No drops, nice long runs and pound it in the end zone from one yard out to make it 28-7 with 5:54 on the clock. Tailback Cyrus Habibi-Likio is turning into the short yardage back who might not get a lot of carries, but will have many touchdowns to his name. He had two scores on just three carries. Herbert added one more touchdown throw to his stat line when he hit Johnny Johnson III for an 11-yard strike in the front corner of the end zone with 27 seconds left before halftime. Oregon’s Heisman hopeful finished the first half by going 18-of-24 for 237 yards and four touchdowns. That’s more indicative of what the Ducks have as a signal caller instead of the 10 total completions Herbert managed last week. With conference action looming just two weeks away, the Ducks have one more chance to work out all the kinks. San Jose State comes calling next week with a 2 pm scheduled kickoff that will be televised on the Pac-12 Network.